My mother, Dorothy Saul, her sisters, and her mother were active in United Methodist Women and the Women's Society of World Service in the former Evangelical United Brethren Church in their hometown of Findlay, Ohio. They gave programs, followed mission stories, prayed for and corresponded with missionaries, and read the mission books and magazines. I attended "missionary" and circle meetings with them when I was young. I remember choosing a day - perhaps it was my birthday - and giving money to celebrate "Spend-a-day with a missionary." In later years, my mother's circle chose to meet at the senior residence where she and several other women from the church lived, and Mother led programs there well into her 90s. She still prayed for and corresponded with missionaries. As a staff member of the Women's Division for 11 years, I was able to extend their mission participation through my own work. In the last year of Mother's life, I asked her what legacy she would like to leave. Her immediate answer was "I want to help women become missionaries." I knew that gifts to Women's Division and the General Board of Global Ministries are carefully used for the purpose given. So my establishing an endowment with the Women's Division to honor my mother was a natural extension of Mother's and her family's life work and interests. Also, from my reading and work in Women's Studies, I knew the value of empowering women. When women are educated, their families and entire communities benefit. Social justice means that women have the means to support themselves, that women can live without fear for the lives of their family members, and that women's voices are heard in the political dialogue. This is true in all cultures. Women who are oppressed are resilient and determined to improve the lives of their families. They know that peace and justice issues must be addressed so that all persons can enjoy the creation God has offered us. I think my mother knew about the importance of empowering women from her own experiences and mission work. She suffered some workplace discrimination as she dealt with difficult male bosses at the drain tile company where she worked. In some situations, she knew more than her employers. However, Mother always wanted to help women help themselves. In turn, I learned about women's empowerment from Mother and though my academic work and my work with United Methodist Women. Way back when, as a district officer in UMW, I saw women doing much more learning, decision-making. and good work through UMW than through the 'church' administration. I went to graduate school to learn more about women's empowerment. 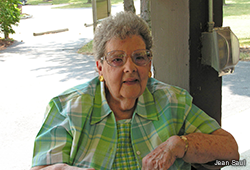 Betty Letzig made the process of setting up the endowment very easy. I transferred stock, got a tax break, and made funds available to offer support for women who want to become deaconesses. These deaconesses then will carry on the tradition of peace and justice-making that was so important to Mother. They will create a better world for women and children - indeed, for all persons. This kind of mission giving was a stretch for me financially - but it opened my eyes to new ways of giving and broadened my thinking about philanthropy. Anyone who gives any amount is a philanthropist. 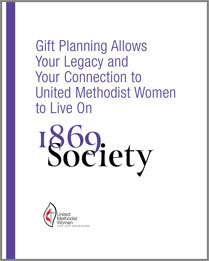 I have always given to United Methodist Women. It felt good to accept the title of "philanthropist" for myself with this gift. I think Mother would be pleased. Jean Saul served as executive secretary for leadership education with the Women's Division in the Denver, Colo., area, 1994-2005.